Well that was quite something, wasn't it? In terms of recovery, it's a good job we've got until July before the quarter-finals. That will be a date with Serbia or Kazakhstan. See you then. More from Leon Smith: "He does that, I just try and help him and don’t stay something stupid. He is amazing. It is a privilege to sit there with him and we will remember that for a long time. "Obviously it is great to be back together after Ghent last year. It is great to be back home and play in front of you guys. We said at the start that it would be difficult against Japan and they improved a lot over the last couple of years but we do have such a great team now, we have great team spirit and we fight on now." Great Britain captain Leon Smith: "I am lost for words at this stage, he is a man of steel isn’t he? "We have to pay lot of credit to Kei. He played a great match, one of the best of his life for sure. "What Andy managed to do was astonishing since he hasn’t played since the Australian Open final." 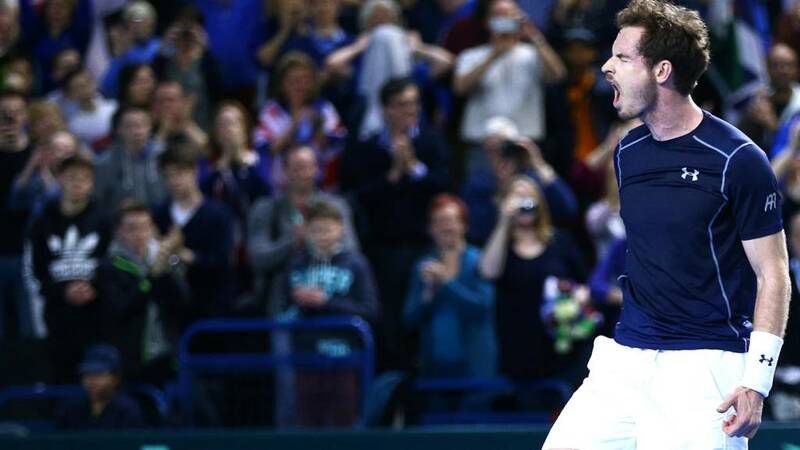 More from Andy Murray: "Last year was incredible every time I played in the Davis Cup. This team did something special and I would like to do the same again this year. "Obviously the next match will be extremely tough and if we stick together and fight we have a chance. "I'm looking forward to getting back. It's Kim's first Mother's Day, so it will be nice to get to see her this evening. I'll try to get back for bath time and to put her to sleep - the baby, not Kim." Andy Murray, speaking to BBC Sport: "The crowd helped for sure. Physically I struggled a little at the end of the fifth set and a little in fourth. "I don’t know if he Dan Evans is relieved or not. It would have been a great chance for him. Thankfully I managed to get through I don’t think we will be playing the dead rubber. Everyone has probably seen enough tennis." James Stevenson: Andy Murray once again proves why he's the greatest British sportsman of his generation. What a match! What a champion! Murray is speaking on court and has mentioned going home to rest. I know how he feels. "The new Dad, he thinks that is exhausting. So are these Davis Cup five-setters." We await news from Belgrade, where Serbia are into a decider with Kazakhstan. Great Britain's defence of the Davis Cup will resume after Wimbledon. "Davis Cup, there is nothing like it. This is a very tired tennis champion." All over. The match and the tie is won by Great Britain, but that only tells half of the story. After almost five hours of court, Kei Nishikori goes long to give And Murray victory. He shakes hands with his team-mates, punches the air and soaks up the adulation of a roaring crowd. Incredible stuff. "Wonderful game. We have seen Nishikori play great matches, but we have got to know him over the last four hours." And another. Remarkable defence from the Japanese.